First Presbyterian Church dates its founding to March 2, 1840, with its charter as the Presbyterian Church of Jacksonville by the Territorial Legislature of Florida. Obadiah Conger, a retired New England sea captain, carried the charter by horseback to Jacksonville. It is probable that the small congregation was meeting prior to that date but this cannot be confirmed. In any event, the church is one of the oldest spiritual congregations in the city. The Trustees named in the charter were Capt. Conger, O.M. Dorman, L.D. Miller, Stephen Eddy, and Harrison Blanchard. In 1843, the new church affiliated with the Synod of Georgia and Conger and William Bartow were elected and ordained as elders. The congregation hired Rev. A.B. Burke as its first pastor in 1844 but had to let him go a year later because of an inability to pay him (the church had only ten members in 1844). Capt. Conger conducted services for the next three years. At first the congregation met in peoples’ homes but in 1844 Capt. Conger and some others were able to purchase the building of the First Baptist Church at the northeast corner of Duval & Newnan Streets. They shared this building with First Methodist Church until 1847. At that time, Capt. Conger donated land at the southeast corner of Ocean & Monroe Streets for the erection of a new church that would seat 60 people. He raised the money for its construction in the northern states and the first service was held on Easter morning in 1847. The old building was sold to the Methodists who occupy the site to this day. In 1855, the building was remodeled and enlarged. Miss Phoebe Swart donated $100 toward this project and later gave the church a lot on Duval Street for the construction of a manse. The women of the church later named the Phoebe Swart Missionary Society in her honor. When the First Presbyterian Church at Fernandina was organized in 1858, ten of Jacksonville’s members moved there. Because Fernandina was organized by the Presbytery rather than Jacksonville, it is not considered a “daughter church.” However, it is reported that after the departure of the ten, Dr. J.D. Mitchell was the only remaining adult male. The War Between the States disrupted the congregation’s ability to function as a church. Like a number of other churches in town, the Presbyterian Church was confiscated for use as a hospital by Federal troops after the Battle of Olustee. It did, however, survive the fires set by both northern and southern armies in Jacksonville. After the war, the Freedman’s Bureau used the building briefly as a school for freed slaves. There is nothing to indicate that the church was even operating during this time. The building was returned to the church in 1867 but by that time much had changed within both the congregation and the denomination. In 1861, southern Presbyterian churches had separated from the Presbyterian Church in the USA to form the Presbyterian Church in the CSA (later in the “US”). This split was related to regional and political differences rather than divisions of a theological or doctrinal nature. Nationally, this division continued until 1983. Some of Jacksonville’s members wanted to affiliate with the northern church while others preferred the southern branch. The congregation divided in 1867, both sides claiming the church properties. In 1873, a settlement between them gave the northern church the building at Ocean & Monroe and the southern church took possession of the manse property on Duval St. that had been donated by Miss Swart. The southern church retained the charter and the name the Presbyterian Church of Jacksonville. After meeting in storefronts and other churches for several years, the southern church purchased property at the corner of Newnan & Monroe, where the old Morocco Temple now stands. It became known as the Newnan Street Presbyterian Church while the northern group took the name Ocean Street Presbyterian Church. Both buildings faced west, just one block, one war, and thirty-three years apart. 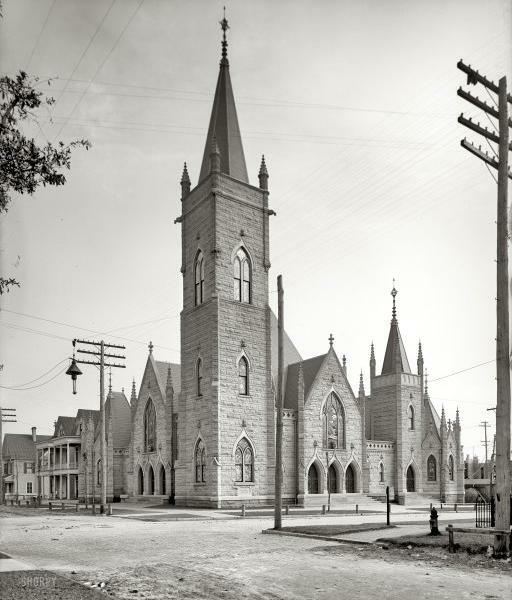 In May of 1901, the Great Fire of Jacksonville”, burned 146 city blocks, and 466 acres which included the church. Construction of the current building began in November 1901 and the cornerstone was laid January 22, 1902. In 1927-28, the sanctuary was remodeled extensively to the present design.